Morgan Silver Dollar Coin Watch, the dial is an uncirculated one hundred year old US Mint issued 90% pure silver Morgan Silver Dollar. Swiss movement, Stainless steel case and luxury bracelet. Usually ships the following business day. Aurista's newest mens watch is a true rarity. The dial is painstakingly crafted from a genuine 100 year old handpicked US Mint issued 90% pure silver Morgan Silver Dollar in a collector's finish. The "Cartwheel" of the old west is one of the most storied and treasured coins in US history. 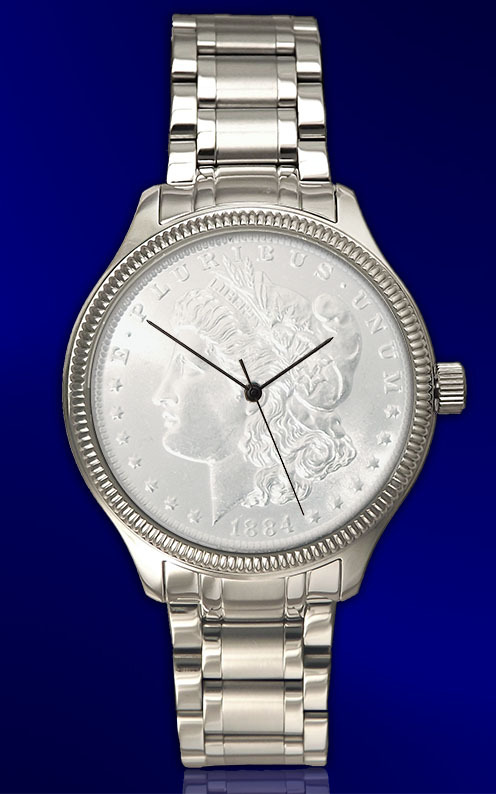 For years, many customers have been begging us to make a Morgan dollar watch to go along with their beloved Morgan dollar money clips. Now their wish is granted. 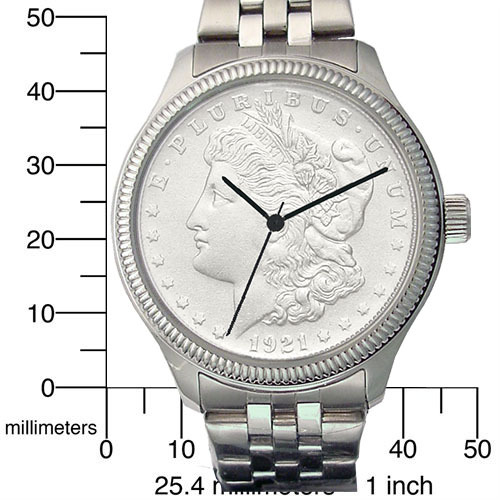 The 38.1mm diameter Morgan Silver Dollar is larger than most other coins available in coin watches. With over 25 years experience, we're proud to be one of only a handful worldwide with the skills required to make this coin watch. A genuine Swiss quartz movement powers each Morgan Dollar coin watch, which is secured within a stylish stainless steel case and our luxury bracelet with butterfly clasp. Each includes a lifetime limited warranty and is accompanied by a uniquely numbered signet and certificate of authenticity. Water resistance: 5 ATM --50 meters. During December 2016 I sent a very rare 1892 South African 5 Shilling coin to Aurista requesting the coin to be converted into a luxury watch. Within a month I have received my watch back in South Africa. I was amazed by the high quality design, as well as the craftsmanship that went into making my personalized coin watch. 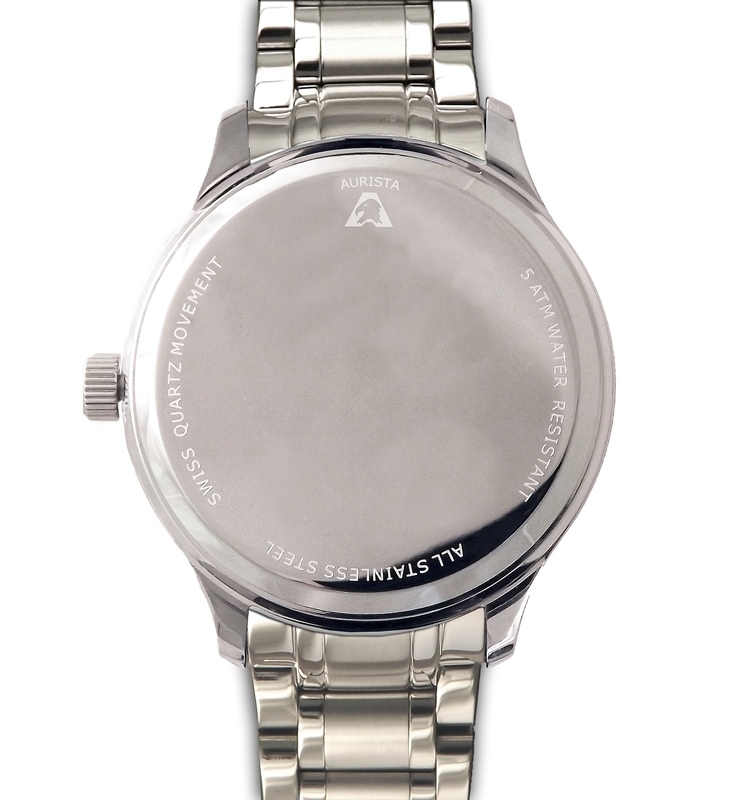 The luxury stainless steel watch complements the Silver coin. The coin was fitted perfectly and the work on the coin indicate that professional people with extensive experience worked on it. (I was told by a number of local watch makers that this would not be possible without causing extensive damage to the coin, but Aurista proved them all wrong.) Showing my new watch to fellow Numismatists, many were left in awe. I have already received offers more than double what my coin was valued at. I will be converting more coins in future and Aurista will be the only company I will trust with this work. I highly recommend this product to any watch collector or any person interested in high quality luxury watches!